Looking for a way to extend your ministry? We empower churches, organizations, non-profits and ministries of all sizes to easily create, customize and manage your own successful online bookstore. See how easy it is. 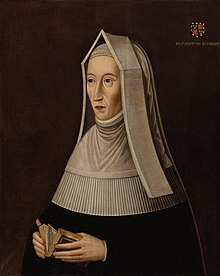 Margaret Beaufort was born at Bletshoe in Bedfordshire in 1441 the only daughter and heiress of John Beuufort, the first Duke of Somerset, grandson to John of Gaunt, Duke of Lancaster and great-grandson of Edward III. Her mother was Margaret Beauchamp. Her father died when she was only three years old and she was brought up by her mother with the greatest care and devotion. While she was very young she was married to Edmund Tudor, Earl of Richmond, by whom she had a son named Henry who was to become Henry VII, king of England . Edmund died soon after the birth of their son, leaving Margaret a young widow with a fifteen week old baby to care for. In 1459 Margaret married Lord Henry Stafford. Lord Henry was her cousin on both her father and mother’s side, who traced his roots to Henry III. They were married for 23 years, but had no children. Her third husband was the Earl of Derby who died in 1504. Lady Beufort was a devout woman and a model of piety and devotion. She was well known for her benevolence and acts of charity, though her life was slightly tinged with asceticism. She rose at five in the morning and from that hour until around ten o’clock in the morning she spent her time in prayer and meditation. In her house she kept constantly twelve poor people, whom she provided with food and clothing. She also gave of her self to those less fortunate. Although she was the mother of the king, Margaret was often found dressing the wounds of the lowest beggars and relieving them by her medicinal skills. Besides her private acts of charity and her gifts to religious houses, she was a generous patron of learning, donating much money for its encouragement. She established Readerships in the Divinity at Oxford and Cambridge . Two public lectures in divinity were instituted by Lady Beufort, one at both colleges, and those generous efforts were only surpassed by her liberality to God’s House at Cambridge , which was reestablished as Christ’s College with her funding. She also provided the funds for the founding of St. John’s College . She was a mother to the students of both universities and a patroness to all the learned men of England . Historians agree that while applauding her many outstanding qualities and virtues, there are only a few things to criticize about her life, which were really only errors of the age in which she lived. Catholics not only see the important part she played in the civil land political history of her time, but they also perceive her life was a high example of the Christian life. Her firm and robust faith bore its natural and wholesome fruits in deeds of benevolence. Margaret Beaufort died in 1509.